Hi everyone, I am participating in the Designer Crafts Connection blog hop this month. 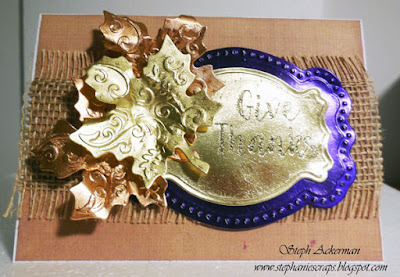 This month we are working with Rinea paper foil from Global Crafting. I was thrilled to receive a selection of paper foils in a myriad of colors, each one gorgeous. I love how easily the foils die cut and embossed. Look at all that dimension! I used a white card and added a panel of kraft cardstock. Next, I added some burlap to give the card a nice fall theme. 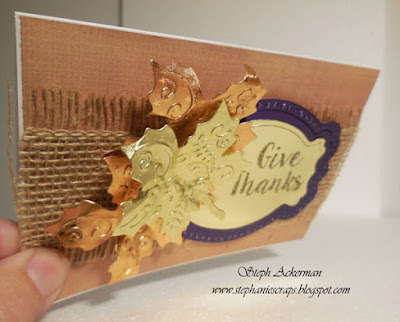 After die cutting the foil, I stamped and embossed the JoyClair sentiment directly on the foil. Rinea paper foil comes in a variety of colors and surfaces. You can find more information about Rinea paper foil here: www.globalcrafting.com. Please stop by the DCC blog to see projects from all the designers. Please leave me a comment, I'd love to know what you think! That looks like a neat product! 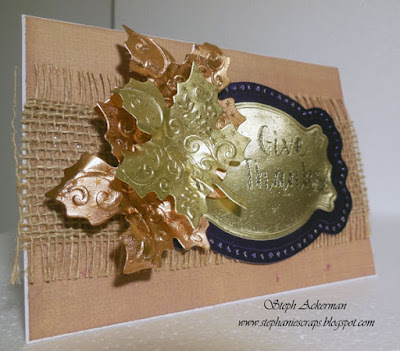 What a pretty card, very fall like with that color combo and the burlap! Thanks Heidi. Rinea foil is lovely and fun to work with. Wow--this is gorgeous. I like the dimension and texture. Hi Steph. Your card is beautiful. I love how you contrasted the burlap texture with the smooth metallic of the foil. Great card! Beautiful card! I learn so much about composition from your work. Amazing, thanks so much for creating such a beautiful project!! Wow! What a gorgeous looking card! If I remember correctly, you heat set the sentiment. I never thought you could use any type of heat with the paper foil! This opens up a whole new option.